Peaches evoke memories for me sitting outside for breakfast on my grandparents terrace in the South of France. The wonderful scent of lavender and rosemary and the sound of the busy crickets. 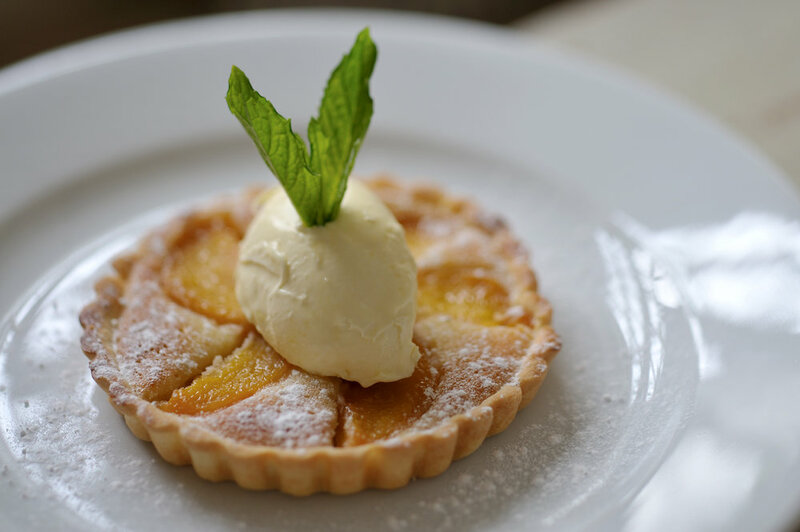 A peach and almond tart is a lovely end to any meal, a perfect summer fruit. The quantity of pastry makes more than you need for a 10-inch tart shell, as does the filling, but pastry freezes well and it's always good to have some to hand. Pastry - place the flour in a food processor along with the sugar, whole egg and yolk. Dice the butter into small cubes and add to the bowl. Blitz. Add a tablespoon of cold water and continue to process, the dough will begin to come together into a smooth ball. Chill in the fridge for 30 minutes while you make the filling. Filling - Chop the butter into cubes and add along with the sugar and almonds. Turn the machine on and add the eggs one at a time. When finished you should have a soft paste that quite easily drops from a spoon. Remove from the bowl and stir in the lemon zest. When ready to use, slice the pastry ball in half. Wrap and return one half to the fridge or freezer. Generously flour your work surface. Roll out the pastry and line your tart case with it, pressing firmly into the sides with your thumb. Chill for 30 minutes. Preheat the oven to 190C/375F/Gas5. Remove the tart case from the fridge. Pour in the almond filling and arrange the peaches decoratively – and return to the middle shelf of the oven. Cook for 35-40 minutes more or until the surface is golden brown and the top is firm to the touch. Cool on a rack and serve in slices, finish with a jug of pouring cream or a dollop of crème fraîche.